This step by step diy project is about how to build a front porch. Building a wooden porch is a complex project, but it will create additional living space and it will most likely liven up the look of your house. If you want to keep the costs at a decent level, you could try to undertake the project by yourself. Check the legal codes before planning the porch, as there are many legal requirements that you should comply with. We strongly recommend you to set out the porch in a professional manner before starting the actual project. Therefore, you need to use batter boards and string. Make sure you check if the diagonals are equal and check the corners for squareness, before digging the holes and fitting the posts. 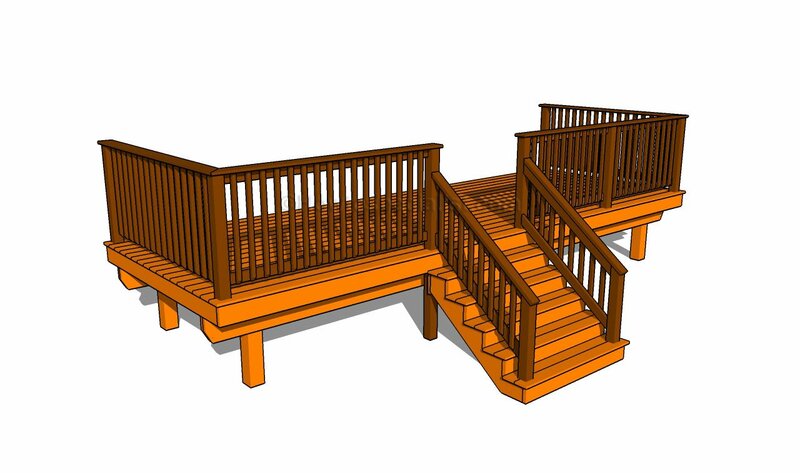 It is essential to decide if you are going to build a free-standing deck or if you will attach it to the house. Use pressure-treated lumber when building the front porch, as the components will be exposed to bad weather. Dig 2-3′ deep holes and set the posts into concrete, if you want to get the job done in a professional manner. Always align and pre-drill the components before inserting the galvanized screws, to prevent the wood from splitting and to get a nice appearance. Take a look of the rest of the deck projects to see other similar projects. The first step of the project is to set the posts into place. Therefore, use 6×6 lumber to build the posts in the manner described in the diagram. Make several cuts inside the marked area and clean the 3″ deep recess with a chisel. Smart Tip: Smooth the surface with a sanding block. In addition, we recommend you to dig 3′ deep holes in the ground and set the posts into concrete. Plumb the posts with a spirit level before securing them temporarily with 2×4 braces. After setting the wooden posts into concrete and making sure their tops are horizontal, you need to fit the girders. Place the 2×8 girders into place, drill pilot holes through the components and insert the 6″ carriage bolts. Drive at least 2 bolts through each post if you want to create a rigid bond. In addition, apply waterproof glue between the beams as to enhance the rigidity of the structure. Lay the joists to the frame, making sure you space them as shown in the image. Work with attention, otherwise the joists won’t be able to support the weight in a professional manner. Attach the rim joists to the framing by drilling pilot holes and by inserting the 3 1/2″ galvanized screws. Use a carpentry square to check if the corners are right-angled each time you fit a component. In order to lock the joists to the girders tightly, we recommend you to use twist fasteners. After aligning the beams at both ends, we recommend you to secure the components together by using the fasteners and appropriate nails. Of of the last steps of the projects is to attach the 1×6 or 2×6 decking boards. Place a nail between the boards in order to create consistent gaps. In addition, we recommend you to attach the railing posts to the framing before fitting the decking boards, as there are a few notches that you should make to fit around them. Smart Tip: Always drill pilot holes before driving the screws into the joists. Moreover, countersink the head of the screws and make sure the head of the screws are at the same level with the surface. Last but not least, we recommend you to take care of the finishing touches. Fill the holes with wood filler and let it to dry out for several hours. Afterwards, smooth the wooden surface with fine-grit sandpaper and vacuum the residues. 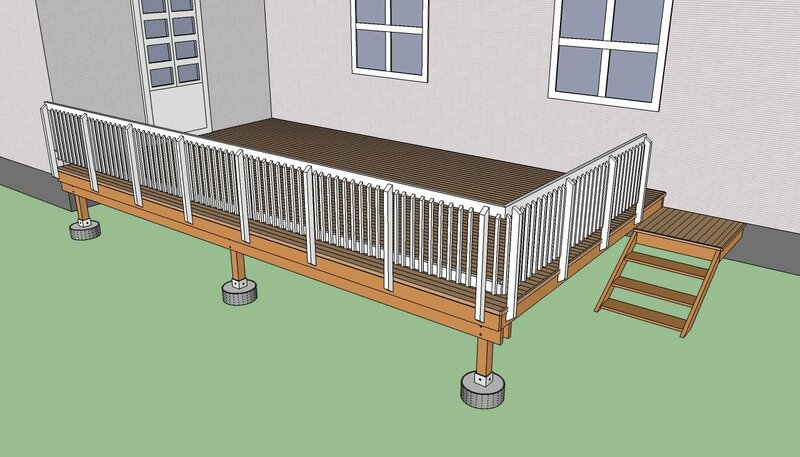 Take a look on the rest of the project is you want to learn how to build the railing and the stairs for the porch. Thank you for reading our project about how to build a front porch and we recommend you to check out the rest of the projects. Don’t forget to LIKE and SHARE our projects with your friends, by using the social media widgets.